3 Minutes to Beach, Private Pool, 3BR, 2BA Paradise! Beautiful screened-in, solar heated pool! Free wireless internet. Huge great room with breakfast bar, three bedrooms, two bathrooms, a full and totally equipped kitchen including microwave, smooth-top range, dishwasher, side-by-side refrigerator with ice water, ice cube, and crushed ice dispenser in the door. The laundry with new high-capacity washer and dryer is located inside and we have supplied you with an iron and ironing board. The living has plenty of seating, a large-screen TV and DVD player. 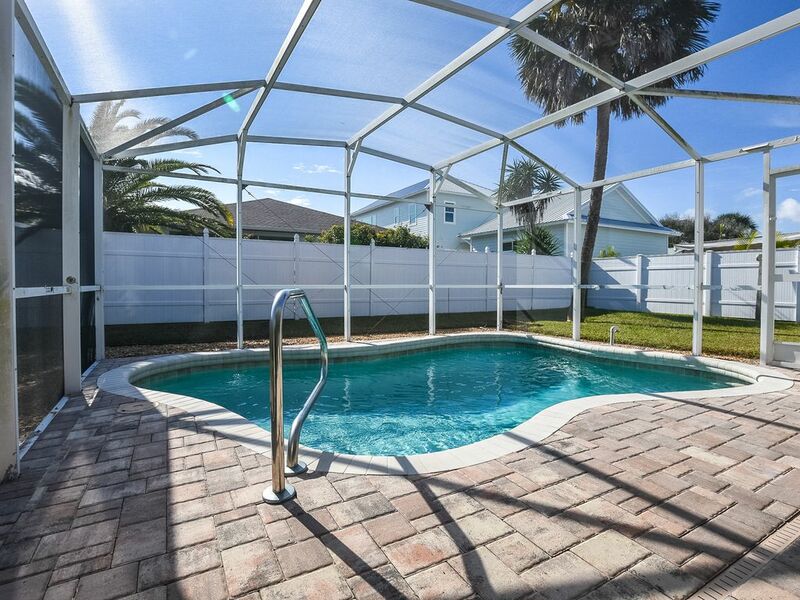 Off the living room is the enclosed pool/patio area where you can have your morning coffee and get ready for the day, whether it be on the best beach in Florida or taking in the attractions in Orlando, Daytona, St. Augustine, or Cape Canaveral. If you opt for the beach, our house is located in the driving section so load up the car with the boogie boards, chairs, beach umbrellas, beach towels, coolers, and toys which are all supplied with the house and spend the whole day relaxing in the sun and swimming in the warm waters of the ocean. When you come back, you can rinse off using the outside shower in the private, fenced-in back yard. If you prefer to walk, it's only two minutes to the beach walkover. The master bedroom has a queen bed, large-screen TV, DVD player, clock-radio, ceiling fan, and walk-in closet. There is a slider to the private back yard and patio. The master bath has a ceramic-tiled, walk-in shower. The guest bedroom also has a queen bed, TV, ceiling fan, and clock-radio. The third bedroom has a bunkbed with a double bed on the bottom and single bed on the top. It has a ceiling fan, TV, and clock radio. No Smoking, No Pets Please. There is a two-car garage and a remote door opener is supplied for your convenience. There's a park just three blocks away with basketball, tennis, and playgrounds. Everything in the house is immaculate. We've furnished it with everything you could possibly need while you're here - it's true when I say all you need to pack is your bathing suit and toothbrush. We even supply hair dryers and curling irons. There just isn't a better place to spend your vacation. The house is close to great restaurants, shopping on Flagler Avenue is within walking distance, and the beach is right across the street (very light traffic - no busy roads to cross). 3-minute walk to the beach. I love the location and the house was very clean and supplied well. This is our second year and hope to rent it again next year. This house has everything you need. Pools supplies beach chairs everything you need for the beach. Location is very close to restaurants and shop. We have rented the house twice and anticipate doing so many times in the future. It is clean, quiet and has everything to make you feel at home. A bargain at any price!!! The owner is great to deal with. Close to everything including many fine restaurants and the ocean. First time for me, CJ, visiting New Smyrna, FL and staying at the Manatee House. MOST AWESOME place!! I had the best time ever and cannot wait to return next year! The home is so comfortable with lots of room. Accessible to the beach as well as Flagler Avenue -- the only two places you really need to go! hahahaha! You can't go wrong staying here! Thanks for letting us enjoy such a great place!!!! Thanks, CJ - Hope you come back soon! Wow, another great time in New Smyrna Beach. The house was everything we were hoping for and more. The fireworks on the beach were great. The pool was fun and the lights were really neat at night. One Week Minimum Guests must be 25 years old to rent this property Saturday to Saturday during high season.